From Publishers Weekly: In this picture book set in 19th-century Paris, a child helps a daredevil who has lost his edge to regain his confidence. Many traveling performers stay at Madame Gateaux's boarding house, but Mme. 's daughter Mirette is particularly taken with one guest--the quiet gentleman who can walk along the clothesline without falling off. Mirette implores the boarder to teach her his craft, not knowing that her instructor is the "Great Bellini" of high wire fame. �McCully's rich palette and skillful renderings of shadow and light sources make this an inviting postcard from the Old World." 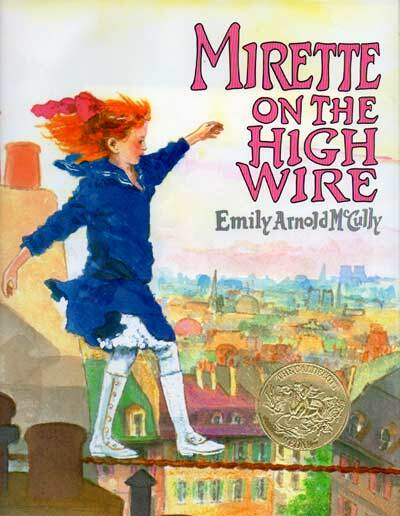 From School Library Journal: �"Mirette, through determination and perhaps talent, trains herself, overcoming countless falls on cobblestone, vaunting pride that goes before a fall, and lack of encouragement from Bellini. The impressionistic paintings, full of mottled, rough edges and bright colors, capture both the detail and the general milieu of Paris in the last century. The colors are reminiscent of Toulouse-Lautrec, the daubing technique of Seurat. A satisfying, high-spirited adventure." From The New York Times Book Review: Emily Arnold McCully has captured, in admirably few words matched with expressive watercolor paintings, the excitement and stubborn determination of the budding artist. . . . An exuberant and uplifting picture book.